Tickets are available via TicketMaster.com or by calling 800-745-3000. “The quarter-final against Briedis... it is going to be a tough fight. He is the favorite, he is a really good fighter. He has a good school, the Soviet school, punching power. He is also a thinker in the ring, but I think I am the smarter one. "I’ve been giving a second chance,” said Briedis (24-1, 18 KOs) one of the stars of Season I of the World Boxing Super Series. And the Latvian sports hero is undoubtedly a favorite to take home this season's Ali Trophy in the 200 lb division. 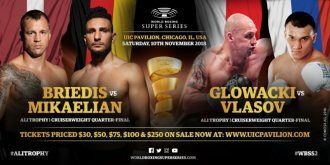 Mairis Briedis vs Noel Mikaelian and Krzysztof Glowacki vs Maksim Vlasov are the two Cruiserweight Quarter-Finals on an incredible doubleheader when the World Boxing Super Series comes to the UIC Pavilion in Chicago. Fans in the U.S. can watch the quarter-finals LIVE on DAZN, the global sports streaming platform. To sign up for a one-month free trial, fans can visit DAZN.com or download the DAZN app to their preferred connected device. Several local prospects will highlight the exciting undercard.